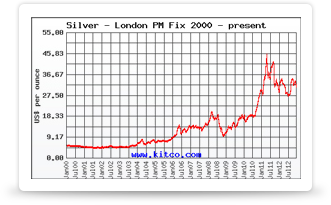 Of all the types of physical silver to invest in, government minted coins especially have high market liquidity. They are certified pure, and so buyers are much more willing to accept government coins. That they can be used as legal tender doesn’t hurt either, although you’re not very likely to see anyone pay with silver coins at the grocers! 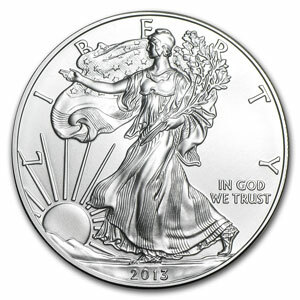 Possibly the most popular and profitable coin to invest in today is the American Silver Eagle. In this article we’ll take a look at this particular coin so you can determine whether it’s a good investment vehicle for you. The United States Mint is the exclusive producer of silver coins in the U.S. 1 troy ounce American Silver Eagles have been produced since 1986 in the Philadelphia Mint, San Francisco Mint, and West Point Mints. These have a face value of $1 USD, meaning this is how much they are worth if used as legal tender. This is the most recognized and trusted silver bullion coin to invest in. As certified bullion, these coins have a silver purity of 99.99%. These are the only silver coins allowed by the IRS to be included as part of an IRA retirement portfolio. The obverse design of Silver Eagles has always included a tribute to Adolph Weinman’s 1916 “Walking Liberty” half dollar as well as the year of minting, phrase ‘In God We Trust’, and word ‘Liberty’. The reverse design contains an image of the Great Seal of the United States and phrases ‘E Pluribus Unum’ and ‘United States of America 1 oz. Fine Silver-One Dollar’. The diameter is 40.6 mm, and thickness depends on the type of coin. Uncirculated coins are 2.98 mm thick while proof coins are 3.10 mm thick. Uncirculated coins are those that have not been in circulation and used as currency, so these are in mint condition- shiny and smooth. “Proof” coins are similar to uncirculated coins in that they are brand new, but these have more embellished designs on the body that make them attractive for coin collectors. Depending on the year and location of production, proof coins can bear a mintmark of “S”, “P”, or “W”. The silver content in both proof coins and uncirculated coins is the same. A mint condition 1 ounce American Silver Eagle will sell for around $3 to $5 above the spot price of silver while a proof 1 ounce American Silver Eagle coin will sell for $50 above spot price. Uncirculated Silver Eagles are available for purchase from the US Mint individually or in denominations of tubes and “monster boxes”. Tubes are a collection of 20 coins. Boxes contain 500 coins in 20 coin tubes. Buying in bulk is cheaper, so it is advisable to buy larger quantities. The Silver Eagle especially has a history of performing well, so while this is a larger investment; it is one that will certainly pay off for you. Silver Eagles are also available for purchase from local and online dealers or online listings such as eBay. Production numbers for the Silver Eagle have always been high, as they’re always in great demand. From 2008-2010, proof and uncirculated coins were not minted due to the recession. In total, over 300 million coins have been sold by the U.S. Mint, with over 200 million of those being bullion coins. On the first day of availability to the public, 2013-dated American Silver Eagles had completely sold out. This goes to show you the high level of demand for Silver Eagles.